The United Nations Postal Administration has released six new postage stamps promoting equality for lesbian, gay, bisexual and transgender people. 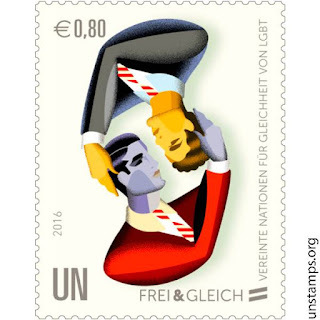 The colourful stamps by artist Sergio Baradat are also meant to celebrate the diversity of the gay community and marks the first time the global body’s post office has issued stamps with an LGBT theme. The stamps were unveiled in a ceremony at the UN general assembly building that included a performance by the New York Gay Men’s Chorus. 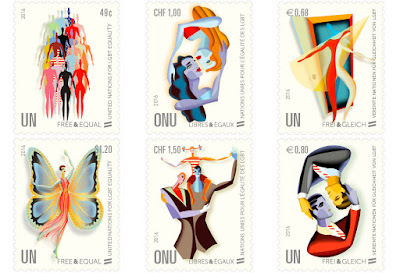 The set of six commemorative stamps constitutes as part of the UN Free & Equal, a global UN campaign for LGBT equality launched and led by the Office of the High Commissioner for Human Rights (OHCHR), UN’s principal human rights official. Available in English, French and German, the series aim to celebrate the diversity of the LGBT community. I think I'll buy them and frame them!